BB code is the short form for Bulletin Board Code. This code is same as that of HTML code, but rectangular brackets surrounded the tags we use in BB code. BB code provides easier and safer way to format posts in forums. This is a lightweight markup language mainly used to format posts. V Bulletin is an example for the using of BB code. The BB code input can be transformed into HTML code without errors. HTML stands for Hypertext Markup Language. HTML is the standard markup language for creating web based applications and pages. World Wide Web Consortium developed it which is simply called as W3C. The elements present in the HTML code are the building elements for HTML pages. Web browsers do not display the HTML code but just reads the code and displays the content what the user needs to be on the page. BB code will be resolved by the message board system before translating into a markup language which can be readable by any web browser. In vice versa, HTML code is transformed or formatted into BB code as it is a light weight markup language. There are a lot of online tools which converts HTML code into BB code format. 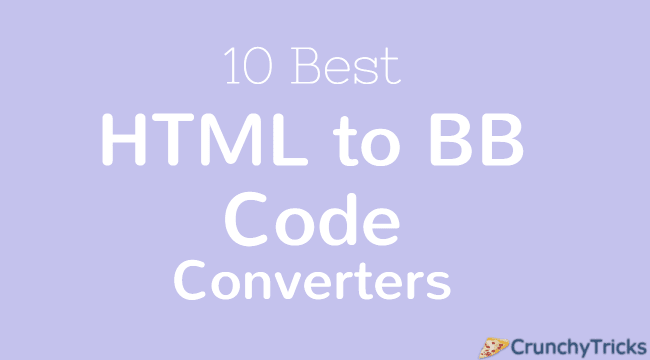 It is one of the easiest and best converter which allows the user to convert his HTML code into BB code without bringing additional errors. In this, it gives the option for checking ASCII art. The user can upload an URL directly or write/paste the code in the given place which he needs to convert. It allows the user to download the converted files into .ZIP or .TXT file formats. The best and secure handling converter for the user in which user can convert HTML to BB and also vice-versa. This tools is very useful for the advanced users who regularly visit forums. It gives various options in writing the code by allowing the user with ms-word features. Oddity gives a preview option for the user to cross-check. It is a straightforward and fast accessing converter. In this, the user has to place the HTML code in the text box and need to press submit button. This gives a unique feature that the HTML code which is not converted will be removed. This converter also provides the option to convert code into vb code, SMF code, etc. It is an online converter in which user can easily convert HTML code to bb code. It allows the user to write an HTML code or can paste the code which the user wants to convert. This converter can be easily used by the first time user also as there are no significant unique options for converting. It is an online based converter which allows the user to paste not only the code but also edit code option. The converter comprises of an inbuilt editor which gives different editing options to the user. The user can insert the URL from direct websites also which he wants to convert. Here the user can type a simple text also to convert it into required format. All the user has to do is just place the code in the text box and click the submit button. The code which is converted into BB code is displayed on the screen, and the code which is not converted will be removed. It gives the different user types of code conversion options. It is the best converter in which the user can just place his code and can convert the code into BB format. There are no confusing options for the user to handle. The straightforward and spacious tool which gives a clear view about the both codes to the user. The user can manage the tool without any previous experience also. This converter gives the user the optional facility by providing the inbuilt tags of HTML code. By this, if the user had just a basic idea of writing HTML code can also convert it into BB code without any mistakes in his HTML code. This also allows the user to switch from different formats for conversion. Finally, it also allows the user to switch back to HTML code. This Converter is an accurate and easy way to convert HTML code to BB code format. It allows the user to convert the code easily after pasting the HTML code in the given textbox. This converter just converts the code into BB code and displays the converted code just below the placed code. It is a user-friendly tool which allows the user convert code into any required format. The formats this tool gives are BB code, URL, etc. The user can get instructions about the different types of formats in this tool. The instructions in the tool make the user-friendly tool, and also user finds it easy to use.